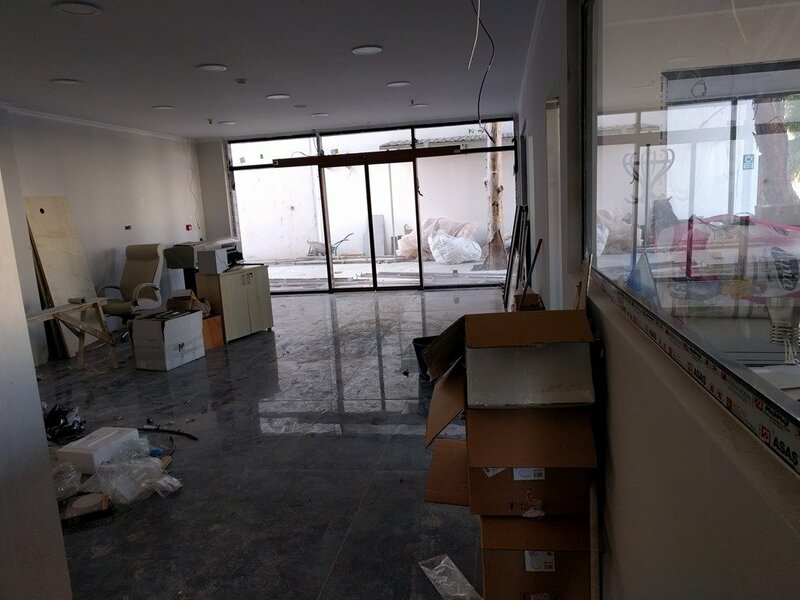 A bit of a slower week as the move to the new Naval Yachts shipyard continues as we are now in the midst of the most disruptive phase; moving the people! Moving the boats was relatively quick and easy but moving all the staff along with all our computers, monitors, desks, chairs, printers, has been taking much more time. However such disruption hasn’t prevented some very significant progress onboard Möbius, most of which was all up front at the bow this week. Let’s go take a look shall we. My Main Man Uğur is fitting the final piece of hull plating, this fully curved plate around what we refer to as Möbius’ Nose, where our snubber line or tow line will go. This curved plate has to make a very challenging transition from a single point down at the bottom where it joins into the beefy 25mm thick keel or stem bar and then flares out and up a it connects with the top deck surface and wraps around the protruding “nostril” of the nose cone. Here is that full frontal shot promised in the title so you can see how the vertical transition works. 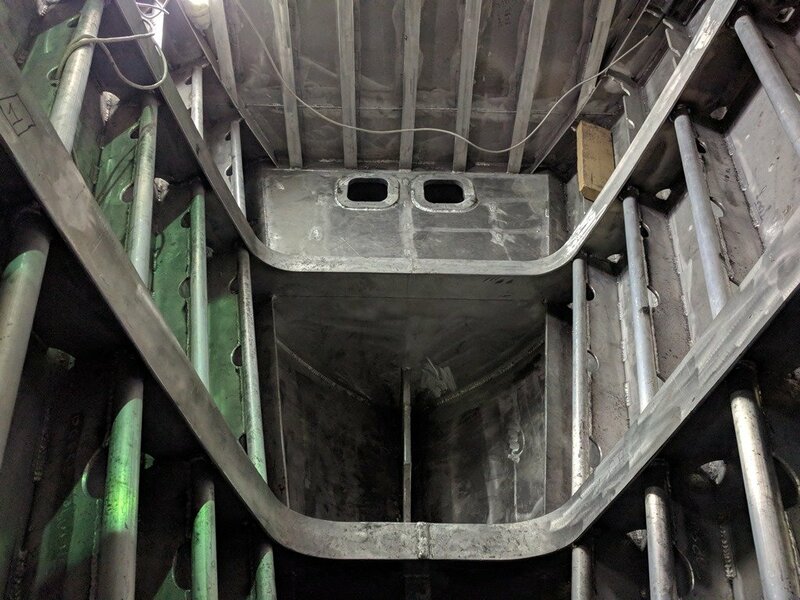 Here is a good look at the business end of Möbius and what the breezes in the anchorage will see as they come aboard and head for the vents in the Pilot House overhangs to keep a nice breeze flowing through all the Cabins and the SuperSalon. 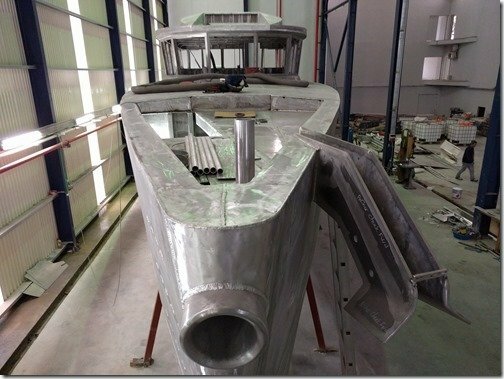 Sezgin made short work of laying down all the final welds and in doing so completed all the hull plating. Still lots of other details to work on such as hatches, SkyBridge roof, arch and more but the hull itself is now fully plated and we now move on to completing the rest of the aluminium “hotworks”. One example of the more detailed work now going on inside the hull is seen here inside the forepeak storage area. Watertight Bulkhead and Frame #1 you see as the “wall” at the far end of this photo is 1 meter aft of that beautiful nose cone above and this area from the bow to this bulkhead is completely welded shut to act as a completely sealed “crash compartment” should we ever hit or be hit by something big and hard right at the bow. 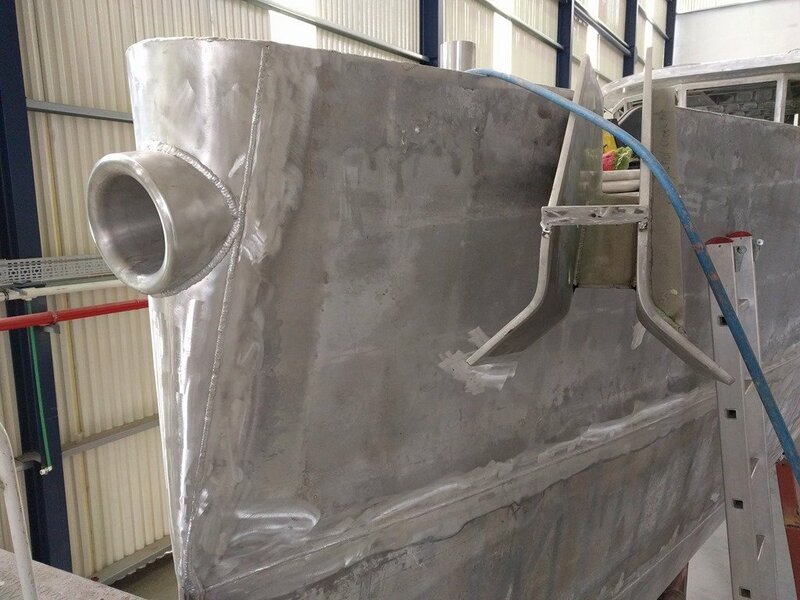 The huge thick stem bar would take the brunt of such contact but if such unlikely contact was severe enough to puncture the 15mm / 5/8” hull plating in this bow section and 6 meters aft, then this crash compartment would be all that was breached and not allow any water into the boat itself. Moving forward and standing on Frame #2 looking straight down will give you a sense of scale of the framing in this bow area. Another detail you see here is the pipe that has been welded along the edges of the scalloped longitudinal stringers that run down the entire length of the hull and are spaced about 200mm/8” apart. The pipe eases these edges in areas like this where it would be possible to be thrown against them in heavy seas and the scallops provide handholds everywhere which double as perfect places to tie down fenders, lines and other items that we want to store here in this very large Forepeak area. 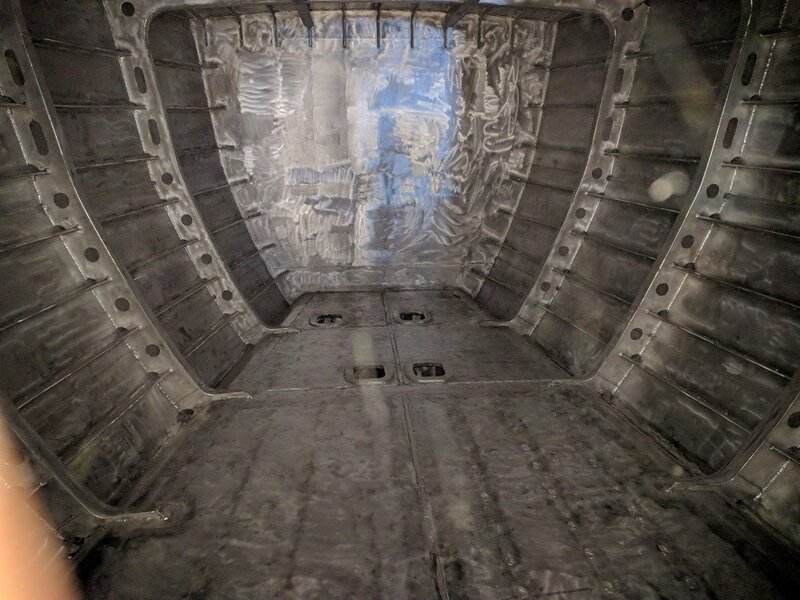 The inside of this Forepeak Storage area is difficult to photograph but here I am standing with my back against that Bulkhead/Frame #1 you see above and looking aft towards the next WT Bulkhead at Frame #4. The large void front and center of this shot will soon be fitted wtih the 300mm/12” diameter tube for the Bow Thruster and the two tank access ports you see behind this are for the Gray Water holding tanks in case we are ever in an area of the world that requires us to capture and hold all the water from our sinks and showers. Looking up a bit will give you a better sense of how large this area is and the great headroom available which is about 220cm/7.2ft so no danger of hitting your head in here. The forepeak is 3 metres/10’ long overall so this is a very big space to keep all the gear we need up front such as dock lines, fenders and such. Other parts of this volume will be used for a large black water (sewage” tank that will go in the upper right corner of this photo. Looking over to the upper left corner above you can see the large access hatch opening and that work light is doing a good job of highlighting how those same pipe crowned stringers create the perfect set of steps for getting in and out of the forepeak with great foot and hand holds all the way down. Moving aft to the other side of that Bulkhead/Frame #4 puts us into this much more spacious area which runs from Frame #4 to Frame #9 so 5m/16.4ft long as the hull quickly widens out as it moves aft to give us a fabulous Master Cabin. The Head/toilet and shower will be on the left with the washer, dryer and a hanging locker on the right with a sink and vanity against the bulkhead in between. Our Queen bed will be in the lower left in this photo and the stairs up to the SuperSalon are behind me to the right of this shot. Popping out of Möbius and up to the top of the bow of mv Legacy I snapped this quick birds eye view of Möbius that will give you more of a sense of her slender girlish figure that will help her slice through waves and glide through nautical miles of Mother Ocean with maximum efficiency. Back down on the ground and moving inside the new Naval shipyard offices here is a quick glimpse of one of the more than 20 office spaces in this beautiful new building. Just outside the office above is the main door and reception area and you can see that work is still progressing on finishing off the interior with lights, fittings and floors but it is a wonderful new space for all of us to get even more work done on all these awemazing boats that Naval Yachts is creating. And I will leave you with a mystery question this week with this peek of the latest bundle of materials that just showed up alongside Möbius. Can you guess what this tubing rectangular and round will soon become? Or this nest of aluminium elbows trying to burst free? Put your guesses in the “Join the Discussion” box below and then be sure to tune in next week to find out if you were right?! 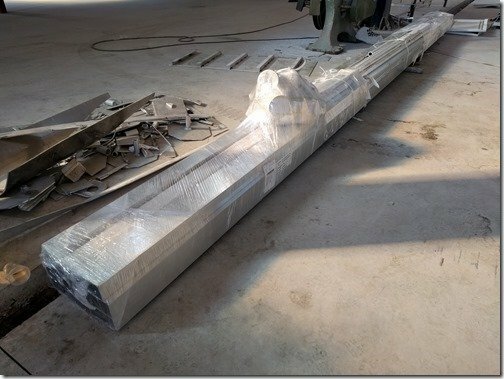 Good guess of topside rub rails Orville, but they don’t arrive from the specialty bending facility up in Istanbul for a few more days. Hadn’t thought about using our nose for an ice cannon but that’s a great idea for future upgrades so it is now on the list, and if it is OK with you I think I’ll upgrade it to a laser cannon? Or perhaps a supersonic cannon? Christine and I both climbed down into the Forepeak locker yesterday and marvelled at all the space we have up there and what a huge step up it is from our previous boats. We could have REALLY used it on our former boats as they were all sailboats and this would have been SO useful to have the ability to stow and extract from our sail inventory up there. However with her larger size just stowing all the bigger lines and fenders will use up a lot of this space and it will also have its share of equipment up there with things like the forward Black Water tank, the VacuFlush vacuum generator, windlass and kedging winch motors, water pumps, electrical boxes, windlass controls and so on. We also really like how well the pipe capped stringers have worked out to be multifunctional serving as everything from a super safe and secure ladder in and out without taking any floor space, the added safety when we are down there and are tossed into the sides with a passing speed boat or when at sea in larger waves and then how well the scalloped holes will work to be hundreds of attachment points for lines and carabiners to hold things. 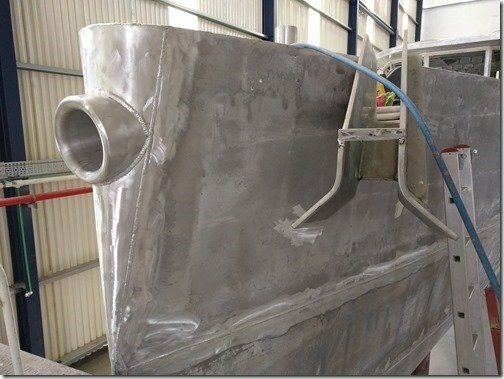 And being all aluminium it is also so easy for us to add new mounts, racks and attachments by fabricating these out of aluminium bits and welding them in place which is partly why we have always carried welders on our metal boats. I’m hoping to add both a small CNC milling machine and a good little 3D printer to add to the regular assortment of tools and equipment in my Workshop so I can continue to enjoy making useful stuff. Gotta start planning for what I’m going to do with all my “spare time” once we finish the build and start passage making again right?? I recall a story from WWII. Apparently a quick repair was needed to return a warship to an up coming battle. When the ship retruned to port after the US Navy victory, the repair crew was permitted back on board ro see the ship. The welders made a straight line to “their” own welds to see if the welding held. Many a voice was heard, MY WELD HELD. 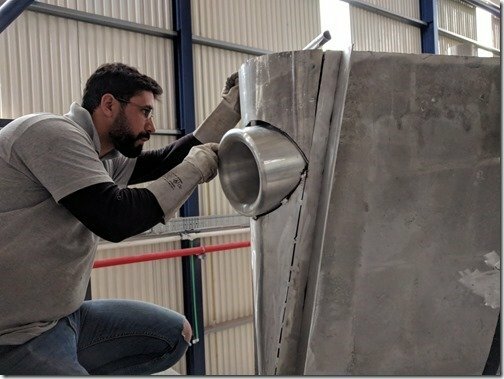 I hope your vessel never faces stress to the welds of that level from any source, at the same time, it would be nice if some time in the future, the construction crew had a chance to see proof that their welds held when it really counted. Great story and sentiment John. One of the things we are so enjoying about building our XPM78 with Naval Yachts here in Antalya Turkey is the true team spirit and pride in workshmanship that everyone on Team Möbius has and we are already looking forward to finding ways to add to their pride. We intend to keep this blog going as we transition into living aboard and putting Möbius to use as she’s been intended and will use that as one of the ways to share with the Team and others here the real world data of her performance and examples of how their work has enabled us to be out there doing what we do. We live and certainly sail on what I call The No Plan Plan so not sure just where we Möbius will be taking us once we launch but for the first few months at least we will be making multiple round trips out of Antalya to a variety of locations here in the Med so that we can come back in to make adjustments and deal with the inevitable “infant mortality” of the myriad of new equipment and systems onboard. So Team Möbius will have many chances in this extended Sea Trials phase to see their work being put to use and tested. We are fully confident in the self righting capability of the XPM’s for example but we are just as happy to do all that testing in 3D models rather than out there in the real world at sea! Hopefully we won’t have too many instances of eXtremely rough conditions or situations to put the hull and the welds to too much of a torture test but you never know what Mother Nature has in store. What we DO know and have complete confidence in is that whatever lies in store, we and Möbius are as “ready for the unexpected” as is possible and that we’ll be sharing it all with you and especially with all the many members of Team Möbius. Thanks for the reminder and story John. This is such an exciting project and I’m enjoying following its creation. I have one qustion and one comment. Comment – in Holland, grey water is an absoluet ‘no, no’. If ever you visit Europe and venture into Holland, you’ll need to be keep to keep all your grey water on board. Question – I’ve searched your site for ‘anchor’ but can’t find the reasoning behind having the anchor off-centre. Is there somewhere on your site which explains this? Also, looking at the above pics, might there be a weak spot where the anchor roller assembly physically leaves the the hull? Thinking of it being pounded by heavy seas and that joint having to take all the strain. Bonjour Piers and Lin, thanks for these tips and questions and joining us on this adventure. We have spent many years all together exploring and living in Europe but not too much by boat yet so we are very much looking forward to it once we launch Möbius. In prep for that we’ve been researching more and more about it and are becoming more aware of how it differs from much of the sailing we’ve done before, notably how much smaller the distances and areas are and how much more limited the open anchorages are. 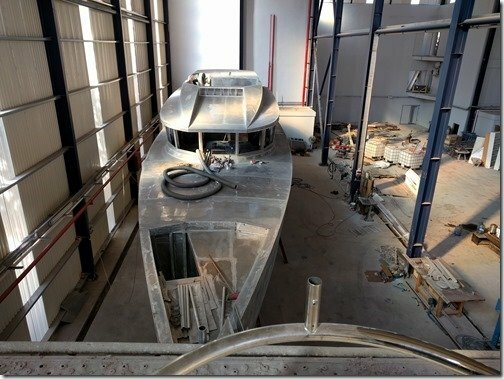 Hence no surprise that there are requirements such as complete capturing of all the Grey Water and so we’ve designed two full sets of Grey Water systems and holding tanks on the boat. There are full Head and Shower compartments in each of the two Cabins so each of these have their own dedicated Grey and Black water systems including their own large holding tanks and pump outs when needed. 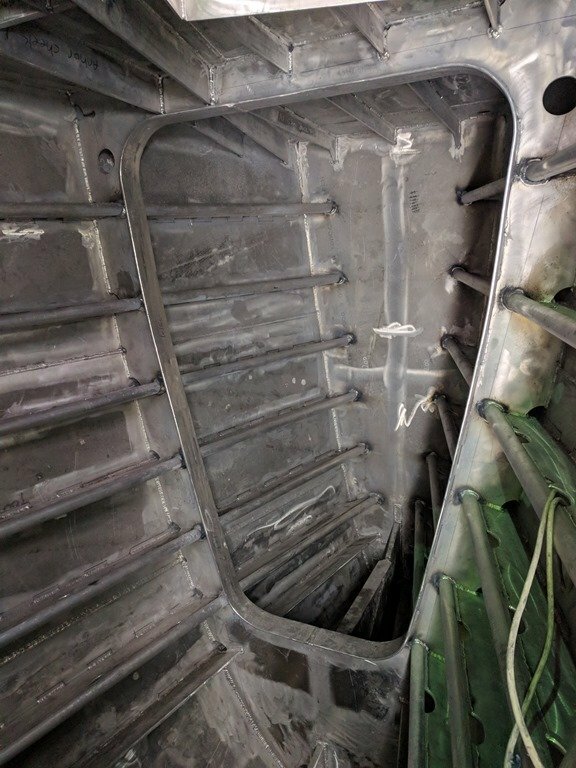 As you’ve been seeing in the photos during the build we are using some of the integral tanks in the bottom of the hull for Grey Water holding tanks and will soon be adding rotomolded polyethelyne Black Water tanks fore and aft. These will all have special Y valves built into their plumbing which can be locked by the certified sealed tags some juristictions use when you check into the country to ensure that the tanks are never able to discharge any of these fluids overboard so I think we are all set to come enjoy the beauty of the Netherlands by water. As for the anchor setup, it has come up in questions here in the blog which I’ve answered but as you’ve discovered I have not had time to put up a dedicated post on our anchoring and ground tackle setup just yet. The short answer as to what led to us creating this “side winder” style anchor roller setup is that we were concerned what a nasty “battering ram” our big 125kg / 275lb anchor and its robust roller system frame was to any other boats or docks that might come into contact with this. The anchor and roller assembly extended about a meter out in front of the bow and so if we were to ever be docked bow in, which is our preference for privacy, then this tends to present an equally nasty head bonker for people walking by on the docks. A situation we have seen on most docks around the world and one we don’t want to contribute to. So we started researching and sketching and playing around with ideas with ur brilliant designer Dennis and eventually came up with the system you see in the photos. This unique design also led us to create that distinctive “nose” that just got all welded up which we are particularly looking forward to using for the snubber line when we are anchored, which is almost all the time, and can enjoy the eXtremely strong, quiet and safe leadthrough it provides for the nylon snubber line going to the big Samson Post. This “nose” has also been designed to serve multiple purposes as a nice big drain when we are washing off all the anchor muck that makes it onboard and a great lead through if we should ever need to be towed or more likely help out other boats by towing them. The anchor roller “cheeks” are 15mm / 5/8″ thick AL plate which extend as single pieces for about 1.5 meters inside the Forepeak and are integral parts of the hull framing. 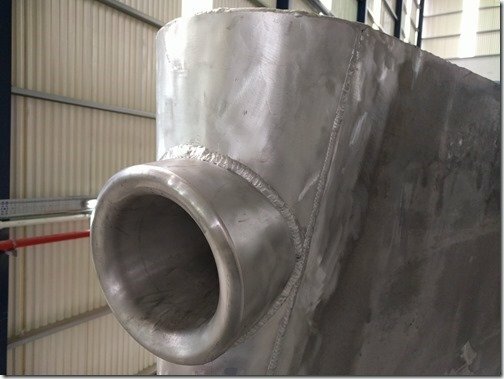 For added strength that whole recessed anchor deck area is also 15mm plate which is then all tied into the 25mm thick Stem Bar that runs vertically all the way up and around that big solid aluminium nose tube so the entire bow is perhaps one of the most eXtremely overbuilt areas of this already tank like hull. However I see the area of your concern where that front anchor roller cheek exits the hull and agree that as it is now that would be a weak point. 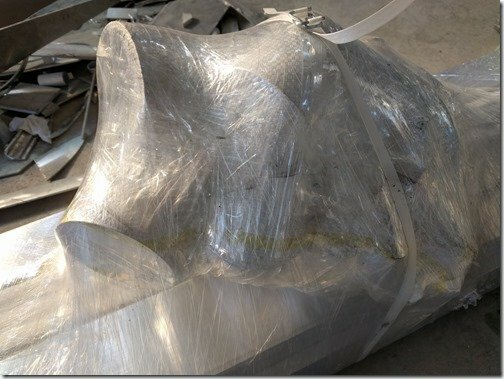 However I think we have this well addressed with the additional framing that you will soon see being welded in place. 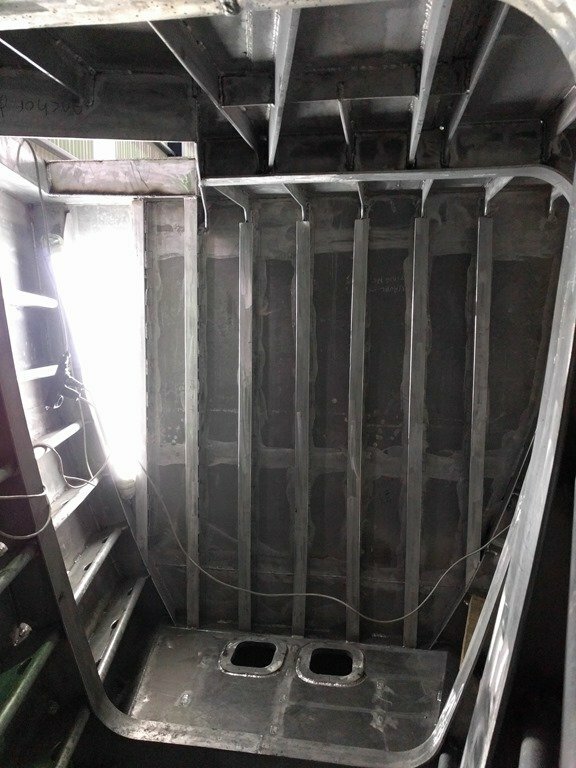 Part of what has yet to be welded in place are the big Rub Rails that cap off the top corner where the outer edges of the deck join up with the vertical hull plates. 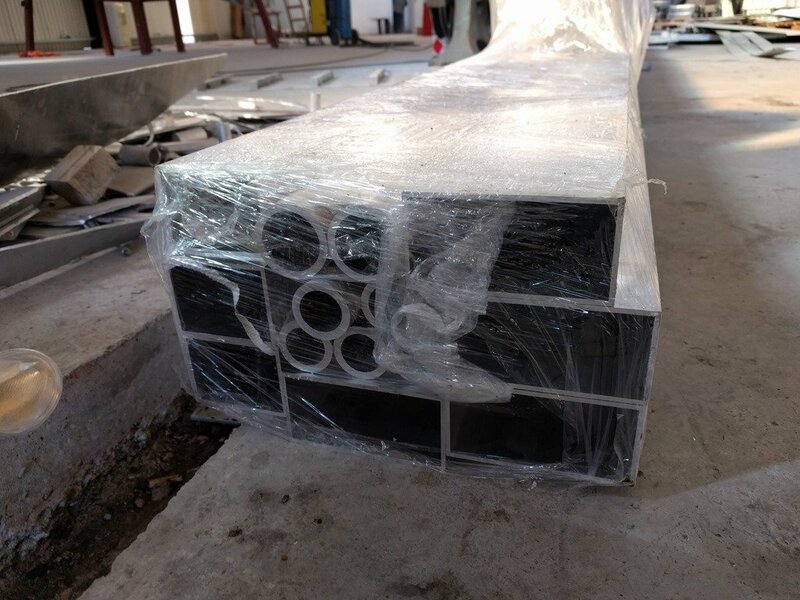 These Rub Rails are being custom bent out of 10mm plate to our specs up in Istanbul and are due to arrive here in a few days so we are looking forward to getting these all welded in place to finish off the deck/hull edges. Once this is all in place around the anchor cheek plates there is an additional triangular gusset that will be welded between the outer edge of the Rub Rail and the face of that foremost anchor cheek plate to tie the whole assembly all together even more. 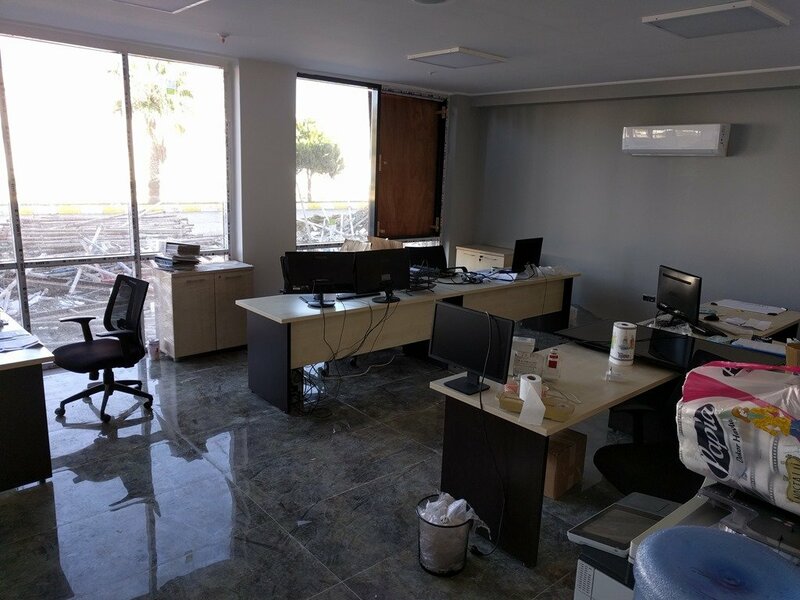 We designed that for exactly the kinds of forces and situations you site and according to the structural engineer who reviewed this design it is many many times beyond any CE or classification requirements. His comment was, “A crane could lift the whole boat from the end of this anchor roller!”, just the response we like to get from him throughout our work with him throughout the design of this boat. 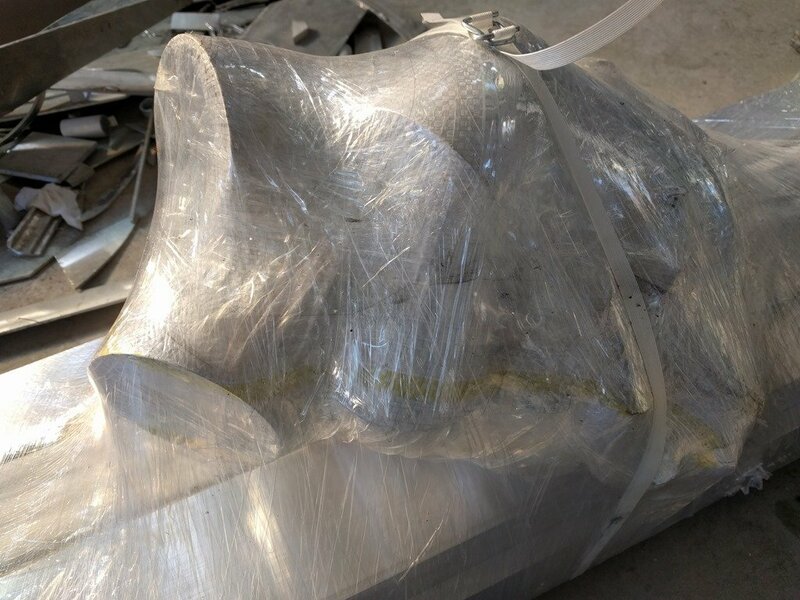 If you look at the ends of these two anchor cheeks you will see how they how Dennis has carefully designed these to provide two large surfaces which exactly match up against the inside surface of the Manson anchor. We will then have a over center type clamp to keep the anchor pulled tightly against those cheeks so that the anchor can’t move and the whole anchor and roller assembly become one. This outer curved surface of the anchor presents a nice deflection for any big waves we are piercing with the bow and will smoothly throw off such water and dissipate the forces and transfer them more smoothly to the hull. So give us a few weeks to get the Rub Rails welded in and finish off the anchor roller assembly and then please do let me know how it looks to your experienced eyes. These are some 5″ wide and keep fenders from rubbing the hull sides. Therefore the hull is undamaged by fender rub. Very timely question Piers as we are just welding in our version of “rubbing strakkes” or Rub Rails as I refer to them in this week’s progress update on Mobius. 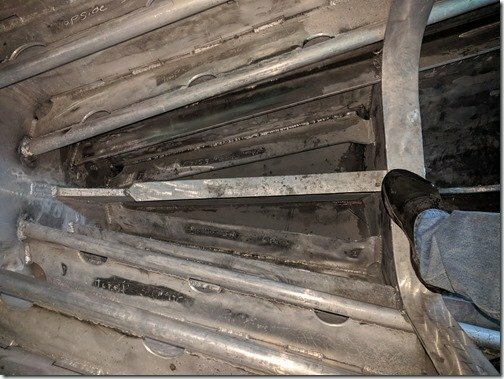 In our case with no paint to be concerned about we don’t worry too much about fender rub but we do like to have these big strong aluminium Rub Rails to deal with “pier rub” and other surfaces we may come into contact with intentionally or not. Have a look at the photos and videos in this week’s update (Dec. 10-14) and see what you think?